Jennifer is the daughter of Wendell and Betty Dawson of Watkinsville, Georgia. 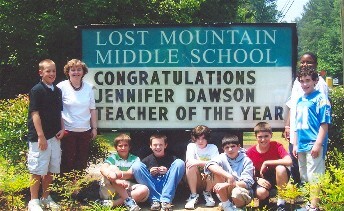 Jennifer Dawson was named 2006-07 Teacher of the Year at Lost Mountain Middle School in Kennesaw, Georgia. 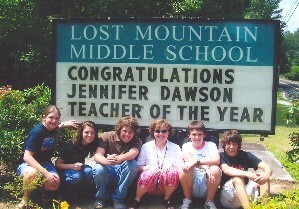 Ms. Dawson has completed her sixth year as a teacher at Lost Mountain. She teaches Social Studies and has used a technique that the students like and learn from. She is to demonstrate the technique at a national conference in San Diego in July of 2006. Jennifer is also faculty advisor to the Helping Hands Club at LMMS. 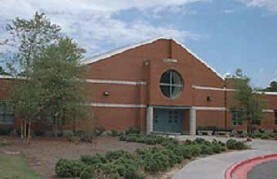 Jennifer Dawson is a 1989 graduate of Oconee County High School, a 1993 Graduate of Mercer University and was awarded a Masters of Theological Studies at Candler at Emory in 1997. She lives in Marietta. Jennifer is shown with some of her students of the current and past years. Congratulations to Lost Mountain Middle School's Teacher of the year! 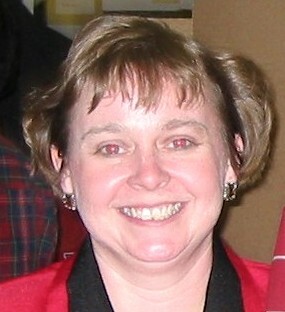 Ms. Jennifer Dawson, sixth grade social studies teacher has been elected Teacher of the Year for 2006-2007!